When I decided to do a fairy garden, I wanted to do something different. I didn’t want to be cliche and actually put a fairy in it. so when I found a teeny tiny dollhouse ferris wheel, my head was spinning (a little more than normal). 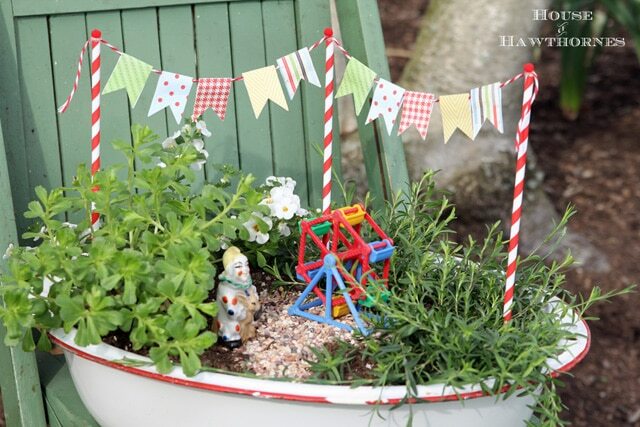 How cool would it to be to have a circus/carnival/fair themed fairy garden? Can you even call it a fairy garden if you don’t have any fairies in it? I may have to check the official fairy garden rule book. 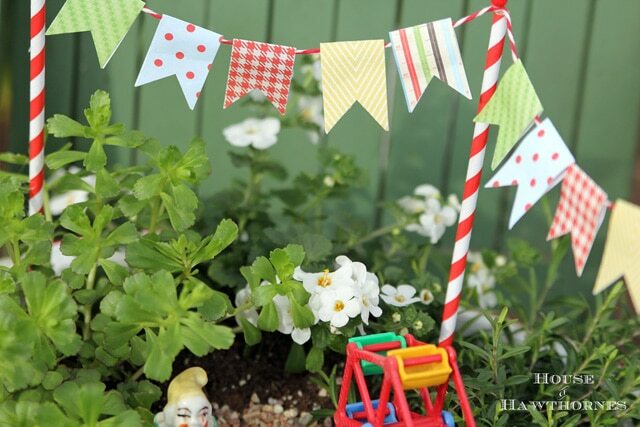 For the flag bunting, I used wooden shish kebab sticks stuck in the dirt with drinking straws placed over them. Then I took bakers twine and glued it to the tops of the poles along with red teeny tiny pom poms. The flag part is just scrapbooking paper cut and folded over the bakers twine and glued into place. Now, you may ask if it is just for show? Of course. The greatest show on earth!!! But seriously, with paper bunting this will only look nice for a few weeks on my covered back porch and then Mr. Clown will be coming back inside to my son’s room for safe keeping. Bacopa Scopia Great White which is trailing and has pretty white flowers on it. 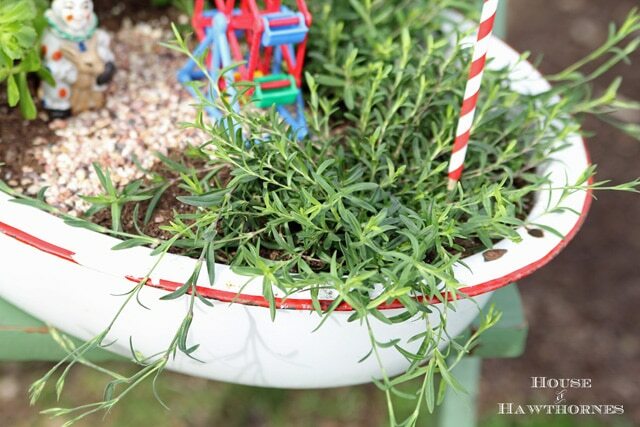 The whole thing is planted in a thrifted rusty enamelware basin previously seen in my Thrifty Finds post from March. Oddly enough, I cleaned the dirt and grime out of it, shined it up and refilled it with dirt. Go figure. Pam, that is the cutest fairy garden! Now my head is spinning with how I make one, too! Have a great week! This is SO cute. 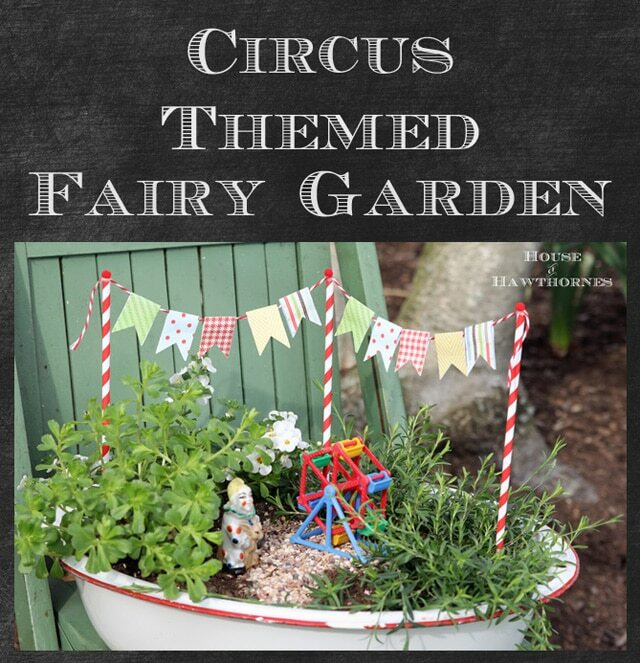 I would never have thought to do a circus as a fairy garden, but that is SO clever. And I love your your clown, too. Do you know my husband is afraid of clowns? It happened when one turned up at his second birthday party. So we like to tease him by giving him things with clowns n them. He says they are all malevolent, and I say he is silly! Oh, I like it…very unique! That is just adorable–knew you woul find the perfect home for the clown :)! So cute!! 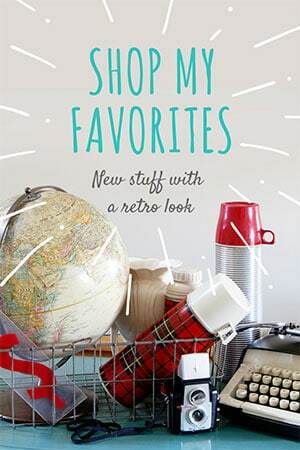 Love this Pam..
How fun is this? I love the little clown you found last week. The banner is adorable! This is right up my alley, my clown alley. Way to go Pam. How beautiful! I’ve been thinking about a fairy garden too! I just love them! What a clever idea. You implemented it well. 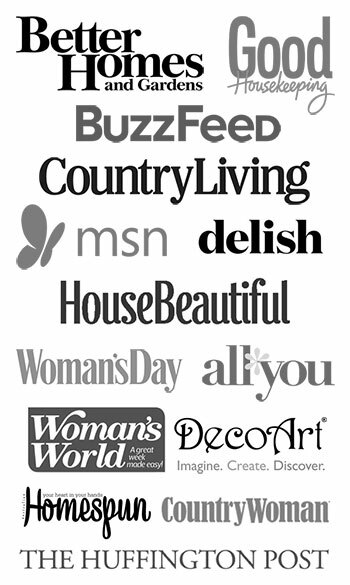 How wonderful, now you have us all in a delightful fizziness looking at all sorts of wee things to use! This is so cute! I love that ferris wheel. That is just plain fun! I love it! How cute is this? I think you might have started something here…fairy gardens minus the fairies. Sweet – good job on the bunting too!! Stop It!!! This is too cute!!!!! Totally clever. 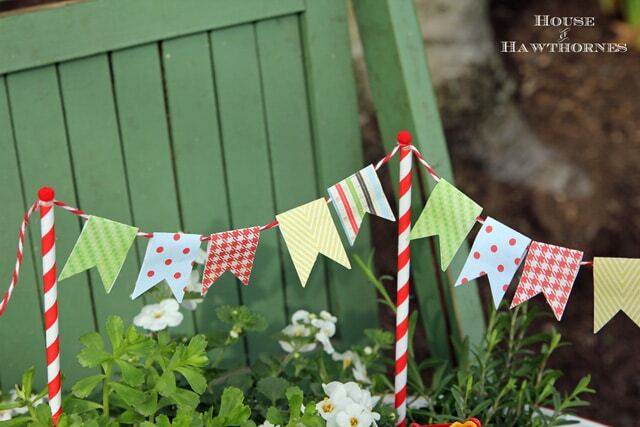 I love mini bunting and using the decorative straws with the skewers is brilliant. Well done. I had plans all last summer to do a fairy garden with Josie and never did. It’s going back on the list (when the weather finally cooperates). That is the best place for that clown! Really it turned out very cute! Oh my lord! Pam that is the cutest darn thing I’ve ever seen! Love, love, love it. I’ve never been drawn to the whole fairy garden thing but know that I know you don’t have to actually have faires I’m thinking I need one too! This is so perfect! Your little Ferris wheel was in my parakeet’s cage when I was a child, to fill each little “seat” with treats! I have one now and I have the pan, I adore this! I even have an old metal lawn chair for the pan to sit on…:) Thank you for sharing! Cutest fairy garden ever – I’m in the mood for cotton candy now! We had one of those little Ferris wheels for our parakeet, too. The parakeet’s name was Knot Head. He would pick seeds out of it, and march up over it while flapping his wings. I haven’t thought about his Ferris wheel in 50 years. 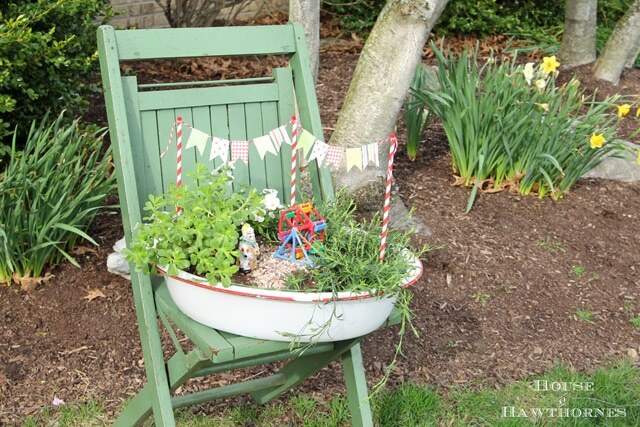 Your little red rimmed dish pan worked out great for your circus garden. It even had a drainage hole in it already. 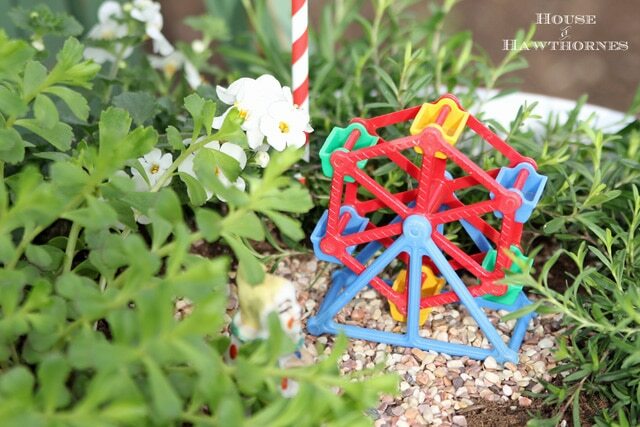 Your clown is perfect in this little garden. It looks wonderfully cheerful. That’s perfect! 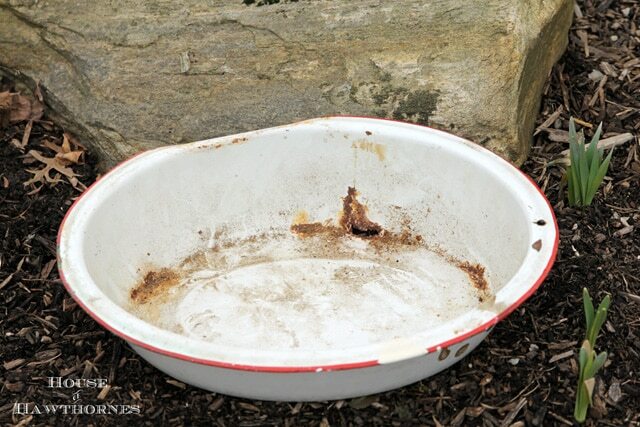 I have an old basin just like that – I was trying to decide what to do with it and now I know. D’s not really into fairies so I didn’t want to do a fairy garden, but now I know I can be completely creative with it. Thanks! You’ve got me thinking now. 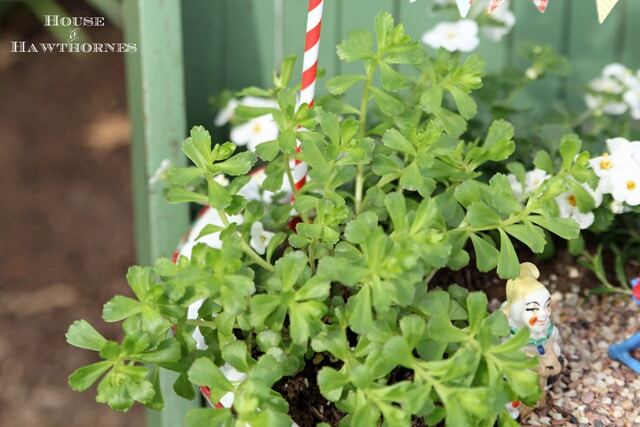 Would mini snow babies in a snow covered planter be considered a fairy garden? I could find a miniature snow shovel……..hmmmmm. Now that is different Miss Pam! Adorable actually, what a neat idea. 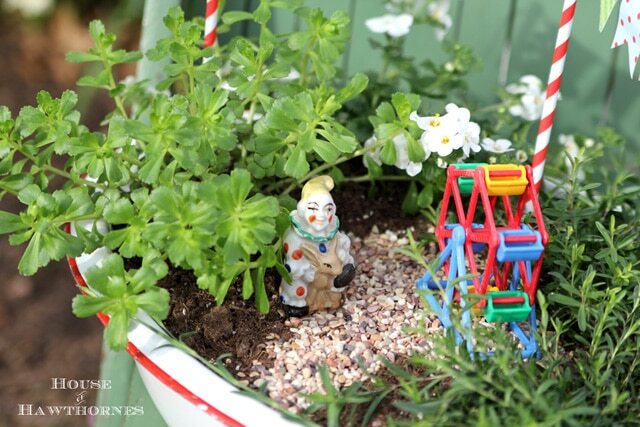 As a lover of fairy gardens and all things fairy…..I would say your clown is your fairy……..very very cute and creative. will have to show my grandkids your photos -they will go nuts. They are into riding around on their scooters and I just bought a fairy scooter for their garden….so much fun. thanks for the creative idea! Great alternative– we don’t always see fairies anyway, right? Hey– that ferris wheel reminds me of one very similar my grandmother had for her parakeets to play with. Oh my! That’s the cutest thing ever–love it! Love this – the theme, the clown, the plants – everything!